Had the original plan been followed, Orlando Salido would have met WBC super featherweight titlist Miguel Berchelt in a potential 2017 Fight of the Year candidate. That plan was scuttled when Berchelt re-injured the right hand originally suffered against Takashi Miura in his most recent bout, but after briefly considering a Francisco Vargas-Salido rematch (the next best thing), the powers-that-be settled on the next next best thing when Miguel Roman was made Salido's new foe. Not only are Salido and Roman two of the sport's best action fighters, they boast plenty of experience -- a combined 36 years and five months of pro ring action, 74 KO wins in 130 fights and an identical 424 rounds each in the professional game. Here's another incredible stat: Roman has been a pro fighter for 45.8% of his lifetime while Salido has been in the pro boxing arena for an astonishing 58.8% of his lifetime. If any two fighters can carry the term "boxing lifer," it is these two, and if their past fights are any indicator, they should produce two-way action that will create memories for a lifetime. Salido has been involved in some of the best wars of the last decade. In fact, his last four fights against Terdsak Kokietgym (KO 11), Roman Martinez (L 12, D 12) and Francisco Vargas (D 12) were incredible battles that saw tons of punishment dished out. Despite Salido going 1-1-2 in those four fights, he emerged the better man in terms of combined statistics. In those four bouts Salido averaged 74 punches per round to his foes' 62, landed five more punches per round (23.6 vs. 18.4) and more than six power connects each round (21.8 vs. 15.2). The most surprising numbers are Salido's accuracy leads of 32%-30% overall and 36%-35% power, not just because he landed slightly more often than he opponents but that the percentages were that low. Other measures of Salido's intensity and aggression can be found in the CompuBox categorical leaders. Salido's 54.5 power attempts per round rank second to Roman Gonzalez's 66.9 and the fact that he ranks first in two categories among world class fighters tracked by CompuBox: Power punches comprised 79.8% of his total output and 91.4% of his total connects. For Salido, it's all or nothing. The question is whether Salido's uncompromising aggression has taken its toll. After all, he's 37 years old and is about to mark his 22nd year as a pro. If his most recent fight against Aristides Perez is any indicator, the answer is no. While it is true that Salido suffered his 10th knockdown in his last eight fights (and the 17th of his career) when a violent right uppercut dropped him in the third, his subsequent attack was so extraordinary that the younger Colombian was forced to quit on his stool following the seventh round. 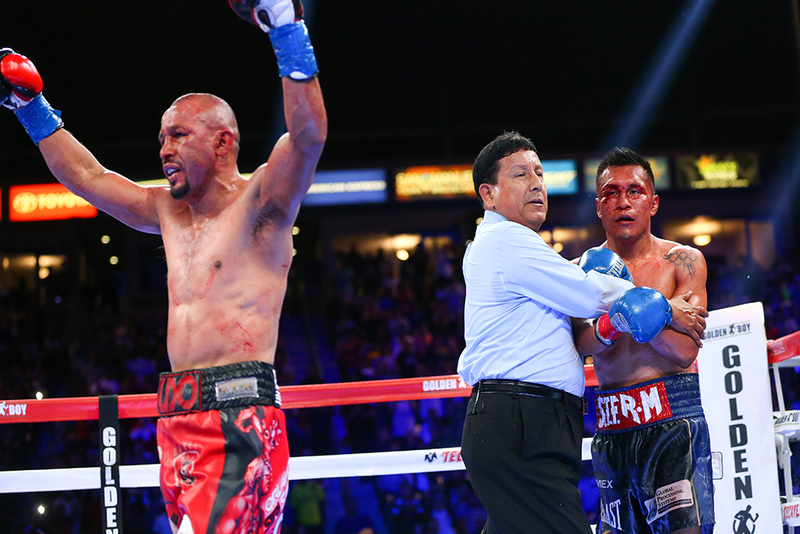 How violent was Salido's attack? Here's how violent: He exceeded 40 total connects in rounds 3-7 and, in round seven, he established new personal bests with 55 total connects and 53 landed power shots, capping a fight in which he out-landed Perez 280-122 overall and 264-112 power while also leading 38%-27% overall and 43%-34% power. His 37.7 power connects per round more than tripled the 13.0 super featherweight average, and his body attack was extremely productive (111 of 264 power connects, 114 of his 280 total connects). The only point of concern is that Salido may no longer be able to make the 130-pound limit without extreme strain. Against Perez he scaled 133 1/2 and inside the ring he appeared to be pushing 150. Can he work his way down to 130 one more time and still be the force of nature he has long been? On the Berchelt-Vargas undercard, Roman gave Miura everything he could handle in the first six rounds but the Japanese's savage body attack (86 of 228 total connects, 86 of 205 landed power shots) eroded Roman's energy to the point that he suffered knockdowns in rounds 10, 11 and 12 as well as the TKO loss at the 53-second mark. Roman's early dominance enabled him to retain connect leads of 254-228 overall, 27-23 jabs and 227-205 power, but Miura's accuracy (39%-31% overall, 48%-35% power), his dramatic increase in pace (from 43.5 per round in rounds 1-6 to 62.8 in rounds 7-11) and the mutually aggressive punch selection (432 of their 482 total connects were power shots) stamped Miura-Roman as a punishing fight that could make the Mexican age overnight. When he returned to the ring less than five months later against Nagy Saguilan, any thoughts about Roman's wear and tear went out the window as he swarmed the 39-year-old Saguilan from first bell to last, scoring two knockdowns in the 12th to cement the TKO victory. Roman averaged 102.3 punches per round (including 84.2 power shots) and used a tremendous body attack that accounted for 169 power connects to overwhelm the veteran. Roman's offense was so prodigious that he vaulted into CompuBox's top-10 lightweight lists on three occasions; his 480 total connects tied for third all-time while his 968 power attempts were fourth and his 447 power connects were sixth. Meanwhile, Saguilan couldn't come close to matching Roman's tremendous output as he averaged 46.1 punches per round (including 43.6 power attempts) and trailed 480-166 overall, 33-2 jabs and 447-164 power as well as 41%-31% overall, 16%-7% jabs and 46%-33% power. Expect a Power Punch Festival: 91.3% of their combined landed punches are power shots (CompuBox avg. :72%) and 79% of their combined thrown punches are power shots (CompuBox avg. : 58.6%). 57.6 of Salido's 71.3 thrown punches (80.8%) are power shots and 19.9 of his 21.5 landed punches (92.6%) are power shots. 58 of Roman's 74.8 thrown punches (77.5%) are power shots and 21.9 of his 24.3 landed punches (90%) are power shots. Only Srisaket Sor Rungvisai (97.1%) has a higher ratio of landed power shots to total punches. While there was much to like about Roman's post-Miura performance against Saguilan, one must question Roman's shot-for-shot power. Although Saguilan was eventually knocked out for the fourth time in nine career losses, it took nearly 500 connects to get the job done. Salido, though slower of foot, still has good hand speed, exceptional cardiovascular capacity and his combinations carry more power. This will be a war from beginning to end, and Roman may be ahead entering the fight's second half thanks to scoring a flash knockdown (Salido has suffered 10 knockdowns in his last eight bouts, including one in his most recent outing). But assuming that Salido makes weight comfortably (and this fight will take place at 135 instead of 130), Salido's dogged attack and superior power will eventually catch up to Roman just as it had in the Miura-Roman bout, and that will earn Salido a hard-fought 12-round decision victory.